Teacher diversity is a big problem in education—and the one cause everyone agrees on. White students are a lot more likely than black students to have teachers who look like them. * That has to change. There aren’t many things that everyone agrees on in the gladiator pit that is discourse about education has become. But right now, teacher diversity is one of them. If you’re a white kid at an American public school, there’s a good chance you’ll have a teacher who looks like you. If you’re a student of color, however, those odds are much lower. Last school year, the American public school population became majority nonwhite for the first time in history. That switch is explained, according to the Pew Research Center, by a rapid increase in Hispanic and Asian children born in the United States. But while minorities have become the majority among students, America’s teachers are still overwhelmingly white. A report last year from the Albert Shanker Institute (which is affiliated with the American Federation of Teachers, the largest teachers union in the United States) found that minority teachers, particularly male minorities, are underrepresented in the nine major school districts it looked at. Across the country, between 1987 and 2012 the percentage of nonwhite teachers went up from 12 to 17 percent, according to a national snapshot from the same report. That rate is far too slow to keep up with the changing face of the student population. And worryingly, the number of black teachers isn’t just stagnant—it’s actually declining. The shortage of teachers of color has been a worry for decades, but in the face of schools’ changing makeup, the issue is now more pressing than ever. Few disagree that the demographic disparity needs to be fixed and fast, with the American Federation of Teachers and Teach for America finding common cause on the issue. On Tuesday both organizations will join Acting Secretary for Education John King for a panel discussion on the problem in Washington, D.C. Adding to the urgency is a spate of research that shows how important it is—for students of all races—to have teachers from varied backgrounds. Students of color are said to graduate at higher rates and do better in school if they have teachers from backgrounds similar to their own. Minority teachers often have high expectations for their minority students. In the case of Native American students, for example, it’s been suggested that greater numbers of native teachers could have a positive impact on poor student achievement. 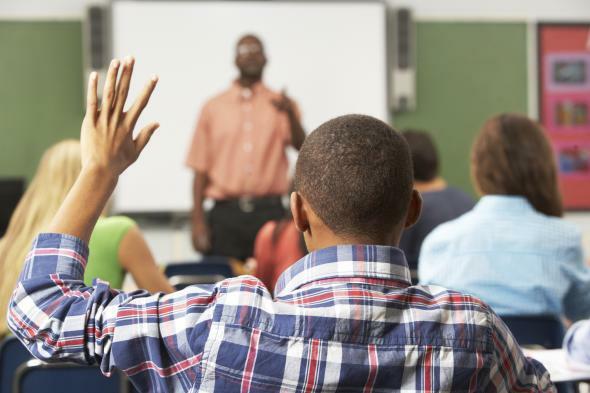 Some research indicates the underrepresentation of black teachers causes black students to be disciplined at greater rates than their white peers. It’s not just a matter of recruitment, however. Getting teachers of color into the classroom is one thing— keeping them there can be just as hard. Harry F. Preston V, a black man who teaches engineering at the predominantly black Edmondson-Westside High School in Baltimore, told me retention is the biggest issue when it comes to teacher diversity. He says getting more teachers like him to stay in the classroom requires schools to offer wages and professional development opportunities similar to the ones found in other industries. Greater teacher diversity has benefits for white students, too. It’s widely accepted that a diverse teaching body—one that truly represents America as a whole—can help curb racial prejudices and disprove stereotypes. One researcher put it bluntly: “If some police had teachers of color in school, there’d be fewer issues that we are having today,” says Leo Casey, the executive director of the Shanker Institute and one of the authors of last year’s teacher diversity report. In the past, according to Casey, nobody has been held responsible for the problem. Researchers found state education departments were reluctant to hand over data—in the case of New Orleans the Shanker Institute had to threaten to sue to get access to relevant statistics. New York state’s data on charters schools was largely “unusable.” Washington, D.C., has still not provided facts and figures that were needed. Casey suspects these districts guarded the data to shirk their responsibilities. *Correction, March 8, 2016: Due to an editing error, the photo caption originally said “White students are a lot less likely than black students to have teachers that look like them.” Black students are a lot less likely than white students to have teachers who look like them.